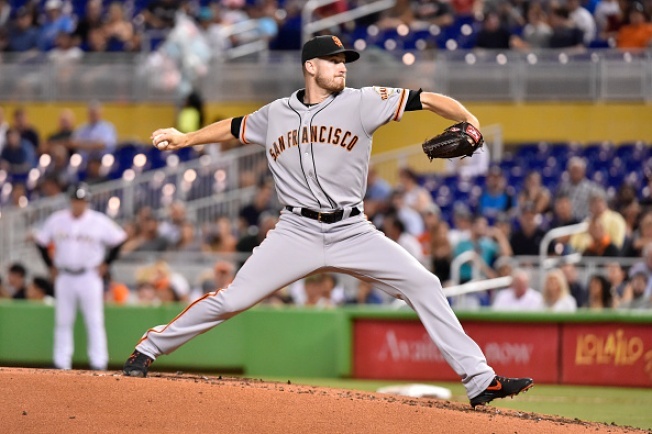 MIAMI -- Trevor Richards pitched six effective innings for his first major league win, helping the Miami Marlins beat the San Francisco Giants 3-1 on Tuesday night. Stratton then settled in and retired his final 13 batters. He allowed four hits in seven innings. TRAINER'S ROOM: Giants: 1B Brandon Belt (appendix) is expected to join the team in Los Angeles later this week after making progress from emergency surgery on June 2. "He soft-tossed in Arizona, threw, did quite a bit of baseball activities," manager Bruce Bochy said. "Tomorrow he'll take regular batting practice so that's the big step. If he feels fine doing that, then we're getting close on him." UP NEXT: Giants: LHP Andrew Suarez (2-4, 5.06 ERA) will start the third game of the series on Wednesday in his hometown for the first time in front of a number of family members and friends.